Form an emotional bond with your user in the language and spirit of your messaging and experience. You do not have to limit yourself to this archaic and silly messaging that is from the days of past. Create helpful and meaningful messaging that gives your user’s the understanding of A) why they got here B) how they can fix it. If you cannot give them those two reasons specifically. Then give them hints to try fixing it themselves. A little side note: Did you know that most of the messaging you see for errors in Windows are actually relics from debugging days of old? The overly complex messaging, “Error 34807” were actually used by the programmers when they have to debug the software in the testing phase. The problem is that no one knew what to do with them from Windows 95 to XP, so they left them because if a customer was stuck atleast it would be helpful to Technical Support in fixing them over the phone. This has evolved into a rather colorful way of being able to deal with problems yourself by giving specific search terms to find errors. When is the last time you called Technical Support on the phone? That being sad, no one in their right mind likes them or wants them to stay. 🙂 Its just a great case of user’s adapting to overcome the limits of the software with their own personal needs. Things do not have to be clinical to be correct. They don’t have to speak to every use case under the sun to be correct. To try and weave a web of user assistance that will include and cover everyone that could possibly be involved in your product, is to doom your experience to the lowest common denominator. When designing aspects of your product, think of how you can design the best possible experience, for the best possible user. The definition of the best possible user is a whole other argument. More importantly, speak to them as people. As you would want to be spoken to. I get irritated when I am simply handed user experience testing results in a neat and tidy word document. It contains charts, and graphs, and these little recommendations on what would get better results. That’s the important part. Results and not experience. The problem with user experience recommendations are they are data driven and therefore not experience driven. It makes the experience as a whole so clinical. I want to see the videos to see the context of these results. Why did they do this? Why did they do that? Why couldn’t they find _____ ? Let me see for myself what happened and when, to see where the breakdown or the eureka came into play. Results can be so misleading if you try to boil them down into a nice tidy package. I encourage everyone out there to challenge results and to push user experience. Don’t let them give you something that doesn’t make sense and accept it so that now need to change your design. If it doesn’t make sense, start a conversation about it.. but most importantly, watch the tapes if they are there so you can understand for yourself. Empathy is the capability to share and understand another’s emotions and feelings. It is often characterized as the ability to “put oneself into another’s shoes,” Empathy does not necessarily imply compassion, sympathy, or empathic concern because this capacity can be present in context of compassionate or cruel behavior. Don’t change your design unless you understand fully and completely the reasons you need to change it and for who and why. To do otherwise is to wander aimlessly.Gather clear direction and purpose from a business need or a user’s needs to discover where your designs need to improve for the user. The reason I discuss this under a post of empathy, because first and foremost you need to remember what your product is for. Users and they are just people like you and me. I always sort of laugh at the term, “go back to the drawing board.” If that were the case, it is underestimating the actual knowledge you have already gained by a failure. Empathize with your users. Eat your own dogfood. To say that a company “eats its own dog food” means that it uses the products that it makes. For example, Microsoft emphasizes the use of its own software products inside the company. “Dogfooding” is a means of conveying the company’s confidence in its own products. The idea originated from television commercials for Alpo brand dog food; actor Lorne Greene would tout the benefits of the dog food, and then would say it’s so good that he feeds it to his own dogs. In 1988, Microsoft manager Paul Maritz sent Brian Valentine, test manager for Microsoft LAN Manager, an email titled “Eating our own Dogfood” challenging him to increase internal usage of the product; from there, the usage of the term spread through Microsoft, as chronicled in the book Inside Out: Microsoft—In Our Own Words (ISBN 0446527394). The phrase became slang during the dot-com craze of the late ’90s, and is used most commonly in reference to technology companies. The product’s developers are familiar with using the products they develop. The company’s members have direct knowledge and experience with its products. Technically savvy users in the company, with perhaps a very wide set of business requirements and deployments, are able to discover and report bugs in the products before they are released to the general public. If you want to design a product for someone. Put yourself in their shoes for as long as it takes to be empathetic. Daily I am surprised at the people who are designing products that they themselves have not, or will never use. If you would not use your own product, how could you possibly design an experience that would be rich or rewarding to someone else? 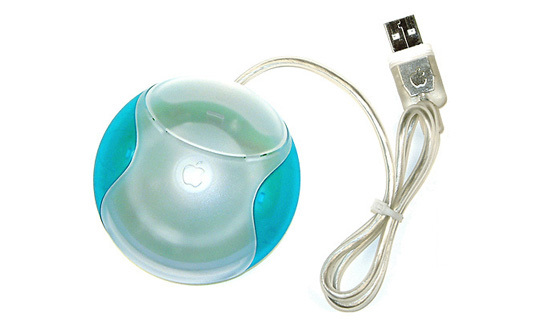 As a natural interface designer I push myself in taking away things like a mouse and a keyboard. I force myself to use the methods that users will use exclusively. I want to empathize with the user who will be using it, so I want to be in their shoes. The easiest way is to limit yourself to the designs which you are creating. There is so much knowledge and experience that can be derived from using a product, form factor, interface when you use it yourself. Here is Youtube video of a Pecha Kucha presentation by Daniel Pink on Emotionally Intelligent Signs as well thats interesting. I’m subscribed to just about every RSS that contains the words NUI or Multi-Touch in the title. One of the better one’s is http://theclevermonkey.blogspot.com. He made a post the other day about how impressed he was with a set of videos on youtube of a mockup from an anonymous person based on what they thought Apple’s new tablet will consist of interaction-wise. It was titled “Move Over Jonathan Ive, Hear comes Jon Doe”. That grabbed my attention. Jonathan Ives is one of the best designers working today. I think he has great talent and he got some wonderful opportunities that really allowed him to flourish. He is great, but the only reason he is great is because he has made several errors. Big errors, as we all do in our careers. Bill Buxton was talking to me about this very thing a few days ago. Great artists make errors, learn from them, and move on. Jonathan has made his share of errors, as well as his share of wins. So, no question about Jonathan’s skills, but who is this John Doe? I made an offhand comment on theclevermonkey about how unimpressed with the gesture language that was demonstrated in the videos. He replied that I should write a constructive and helpful post to point out a few things. So here we are. So, I will breeze over a few of the main concepts that I feel the person missed in their mockup. I only watched 2 of the videos, and will only comment on one, but here is what I gathered from it. In watching the gestures I see confusion between single tap and double tap. At around 4 seconds he does a single tap to change its state after he used single tap to get it into the state? Then does another double tap to zoom out? I’m not quite sure I understand the metaphor around each of the taps. If single tap is select, then how can it also be activate and unzoom/state change. It seems here that the user is going through a pre-determined path of usability rather than real motions. At around 10 seconds after the OnScreenKeyboard use, he does a single tap all the way across the screen on a very small hit target. This seems problematic and does not obey Fitt’s Law. Fitts’s law (often cited as Fitts’ law) is a model of human movement in human-computer interaction and ergonomics which predicts that the time required to rapidly move to a target area is a function of the distance to and the size of the target. Fitts’s law is used to model the act of pointing, either by physically touching an object with a hand or finger, or virtually, by pointing to an object on a computer display using a pointing device). It was proposed by Paul Fitts in 1954. The closing of the keyboard should be thought about in a broader term. Why have the button so small? Why have the button on the other side of the screen? Why not put buttons on both sides to accommodate ambidextrous bi-manual input. Why not change its color slightly to ease speed of use? A very thin row of black buttons is not conducive to a natural interface. at 17 seconds he uses double tap twice. Once to do an “execute” on the video clip, and then again on the File Explorer window to perform a maximize/full screen. Unless in this operation if you “execute” the File Explorer that also goes into a Slideshow mode? I’m hazy on this. at 20 seconds he does a double tap on an image in the slideshow and that propels him into a scatterview experience? Maybe that is a Mac thing that I am unaware of, but if he just performed an “execute” on the icon, why does it go into scatterview? at 27 seconds he uses two-fingers to then move the carousel around? Why has movement now shifted chords? Two-fingers were just used to draw a marquee and do a group select, and now they are used for movement? This is a confused metaphor and not consistent. Thats pretty much everything in the first video besides the simple movements with single touch. To really be critical I would also say that using single touch for movement on a background is a little easy don’t you think? Certain things need to be forgivable, the background being one of them. My main critique over the set is that multi-touch means just that, Multi-Touch. That means more than just two fingers side by side, or even three fingers next to each other. It means thinking about systems in a whole new way. What about offhand manipulation? What about modifiers? Think about occlusion and ease of use. If you are playing a game do you really want to have 3 fingers on the screen to run? then keep them on the screen the whole time? As the author noted in the last movie he had doubts. To be more helpful and instructive I’ll throw out a few ideas. Why not use the offhand as movement and the primary hand as action? So, with your left hand you place down a finger and hold it outside of the quick menu area, this establishes the center of movement, now with any other touch in a direction near your initial touch you are running. This leaves your other hand free to perform actions that might be needed. Now with another tap with your left hand your running is now ‘frozen’ forward so you can remove your hand. Your character is now running in a direction that you chose without much primary attention. Want to change directions? Use two-fingers and slide. Want to stop running? Two-fingers and slide down. Side-step? You get the idea. Using the initial two taps to set motion then two fingers at the same time to give more detailed instructions eases the attention you would need to give it. Think how fast you could do that? That ends the lesson for tonight. Overall, great video. I was very impressed with the videos themselves actually. High quality for a mock-up. Now hopefully you understand my thoughts when I see a lot of passion in this effort, but not quite enough expertise. The thing is …. expertise can be learned. Passion cannot. I hope he continues down this path, we could always use more passionate designers out here. One of the main thought threads going through work and through design as a whole is to know your history. Things have been designed, created, used, and not used over the years. It is of being a good scholar and being a good designer, to know your history. Give credit where it is due. This is of a video of Alan Kay presenting Ivan Sutherland’s Sketchpad from 1963. Yes, let that sink in. 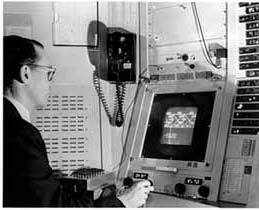 He was using a pen on a screen in 1963, which is a full 20 years before Macintosh and about 12 before Microsoft came to be. It was a seminal paper when he wrote it, and it was way ahead of its time. Even today’s programs do not encompass all the features that he had. Here he is on Wikipedia. You know, there are not that many things greater than seeing something you worked on being put to practical use. I think the only bad thing would be if they were complaining about it. Here, they are absolutely loving it. Granted, I only did a little bit of the work and there is a large team of great designers responsible. I was in on it and loved being able to contribute. I think the visuals are stunning as well. I love seeing how fluid the animations are. Lovely! I have been off of the Surface Team for months but I talk to the current members almost daily. I’m still doing Natural User Interface work, just not directly for them. Its so great to see what is still coming out of that great team over there. This video demonstrates a number of new multi-touch software applications, designed using N-trig’s DuoSense® technology, in collaboration with some of N-trig’s ISV partners, including FingerTapps, Natural User Interface Europe AB, and SpaceClaim. The applications show full multi-touch utilizing up to four fingers, and range across areas of interest from consumer gaming, multi-media management, retail shopping and high-end engineering applications. More info on www.n-trig.com. 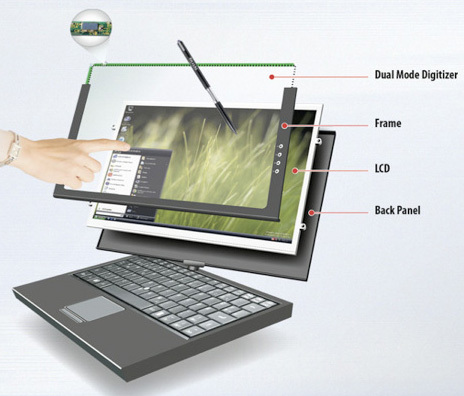 The most important thing to pull out of this hardware is that it is dual-mode, which means it can handle touch with fingers as well as with a pen. This is exactly what I am hoping for in the future of all hardware. A preview demonstration of modeling in 3D using a SpaceClaim’s prototype multi-touch user interface that will be added to SpaceClaim this fall. Also includes clips of ANSYS Workbench, Blue Ridge Numerics CFdesign, and Bunkspeed Hypershot, showing some finger dancing that you can do without multi-touch. There is a lot of random talk about multi-touch out right now due to Apple’s recent “leak” about their possible tablet. Talking to a few Apple fans I came to a realization: they had no idea that multi-touch was out right now. Absolutely clueless that Windows 7 supports MT (multi-touch) and that there is a very large array of hardware that you can purchase to take advantage of it. I was actually a little amazed, but not because of the simple fact they didn’t know about it. I was amazed because they seemed so versed in the subject, but had not even done a simple Google Search to look around. MT has been around quite a long time. Bill Buxton’s very thorough page written on the subject gives a great history and is far better than I would want to replicate here. I will quote a great line from it though, as it definitely deserves it. I highly recommend reading through his page. I have tested, played with, and tortured just about every multi-touch piece of hardware out there and I can tell you that there are some stellar pieces of equipment floating around. The Touchsmart’s are very nice. I currently use one of those as well as a few other devices. Here is the Official Touchsmart Page as well as some nice movies showcasing the technology and features. Remember to install the Windows 7 Touch pack if you get one to really see some of the great things that you can do using ….. both hands, or one hand, or whatever! If anyone has any user experience feedback about these products, feel free to drop me a line.